Anyone who has visited a live UFC event in their lifetime can tell you how electric the arena feels in the moments leading up to the night’s first fight. As catchy tunes blast through the building, preview videos flicker across the screens and minutes trickle down the clock, anticipation of what the men and women behind the scenes are about to do to each other gradually turns into a tickling sensation reaching head to toe. That was the case when, in March 2017, thousands of fans had filled London’s renowned O2 Arena, anticipating the spectacular night of fights that was to unfold in the coming hours. Moments before the lights above the Octagon were supposed to turn really bright for the first time that evening, though, Bruce Buffer took to the mic outside of the cage. Doctors had deemed Tom Breese unfit to compete, he said, scratching the Brit’s bout against Oluwale Bamgbose. While Breese said he hasn’t suffered any long-term damage from the health scare, the decision to pull out preemptively was undoubtedly the right one. Simultaneously, it prolonged a frustrating fight-less stretch that is going to end May 27, a few hundred miles up north in Liverpool, when the Octagon sets up in “The Pool of Life” for the first time in its history. There, Breese is set to come back from a near two-year layoff as well as his first defeat in MMA. 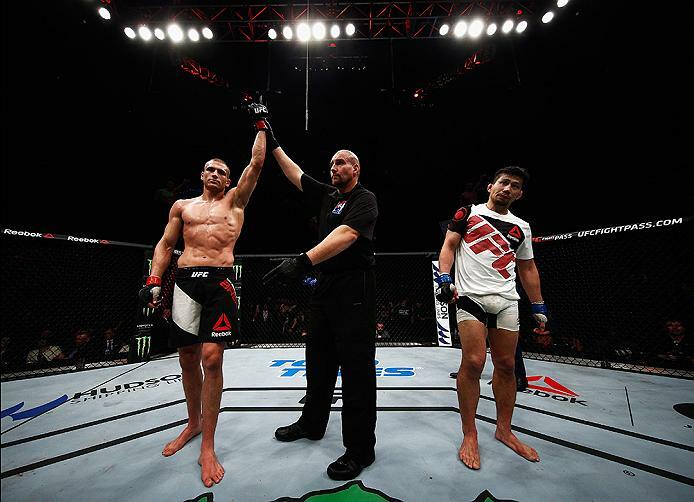 That layoff has been frustrating to watch for anyone who saw Breese cut through Luiz Dutra Jr. and Cathal Pendred during his first two UFC fights in 2015 and had built up expectations of a spectacular career that was to follow. In 2016, though, Breese would go the distance in rather unspectacular bouts with Keita Nakamura and Sean Strickland, winning the first fight by decision before losing the other in that same way. Looking to return to action in 2017, the Bamgbose fight fell through on fight night. A month later, Breese announced on social media that he had torn his meniscus and his ACL, the latter being his second such injury within a couple of years. While Breese said recovery went smoother than the first time because of his previous experience with it, he also had to sit still and watch what could have been. Darren Till had his first two UFC fights on the same cards as Breese had his. The two young Brits seemed to have started a race to become England’s first UFC champion, but when Till returned from his own lengthy layoff last year, he won three fights within five months and propelled himself into stardom with a blistering knockout of Donald Cerrone last October. Now, proud Scouser Till has brought the UFC to his hometown while Breese has to build himself back up on the undercard. While the second half of 2016, all of 2017 and the first half of 2018 will remain empty on his resume, those two years haven’t been a waste for Breese, despite his health struggles. For starters, he will no longer put himself through the rigid weight cut that made him almost unrecognizable when he weighed in as a welterweight. From now on, the scale will show 185 pounds for him. More importantly for his personal life, after spending years in Montreal, Canada at the renowned Tristar Gym, the Birmingham, England native decided it was time to go back home after his UFC 199 loss to Strickland. Nowadays, Breese trains with his old boxing coach Paul Gough again, alongside standouts such as top UFC welterweight Leon Edwards. Those grappling tournaments have stood out the most on Breese’s social media in recent years. While he admitted that he “didn’t always get the results” he wanted on the mats, the experience of regularly switching the flip to competition mode certainly didn’t slow down his path back to top form. And with his Jiu-Jitsu and his hands – which had been his most dominant weapons so far anyway – upped a level or two, that could mean bad news for his new division, in which the 6-foot-3 Breese will still tower over most of his foes. His biggest advantage, though, is mental. Set to welcome back a sharp and happy Breese is four-time Judo Olympian Daniel Kelly. 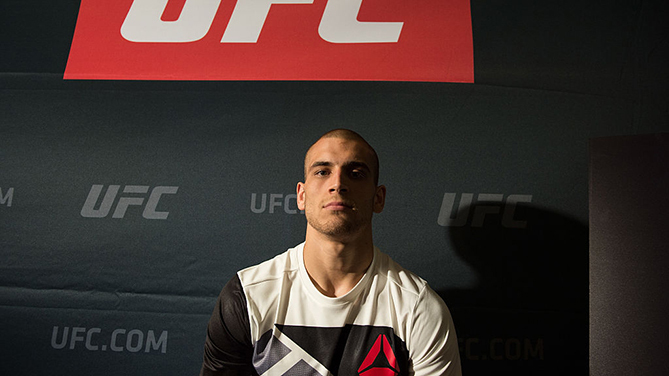 For no-nonsense Tom Breese, public perception is a non-matter anyways. With young standouts such as Breese, that state is when they’re most dangerous. Even for an Olympian.